"There is no doubt that his figures are whimsical, amusing, and charming, but they also have the power to evoke an immediate emotional response in anyone who sees them. Therein lies their wide and ever-growing appeal." - Roberta Vesley, Library Director, AKC. "I’ve received inspiration to accomplish certain things in life, and that figures into a bigger equation. You have to give to get." 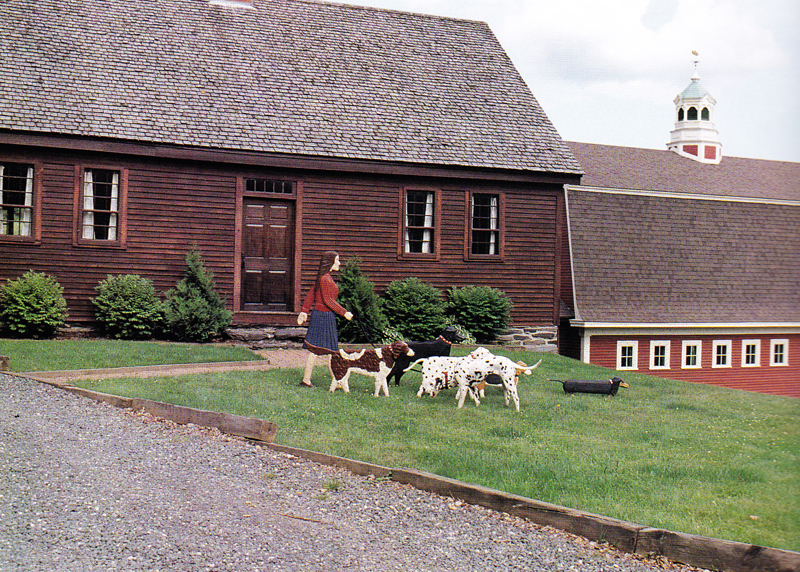 Stephen Huneck's home and studio were in St. Johnsbury, Vermont which he shared with his wife, Gwen, and his three dogs: two Black Labs, Daisy and Sally, and Molly, a Golden Retriever. 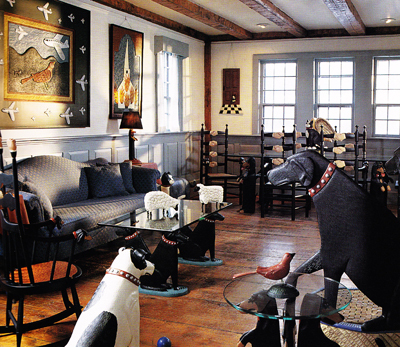 Stephen and Gwen furnished their home wall-to-wall with Stephen's artwork and furniture. He worked in his private studio attached to their house. 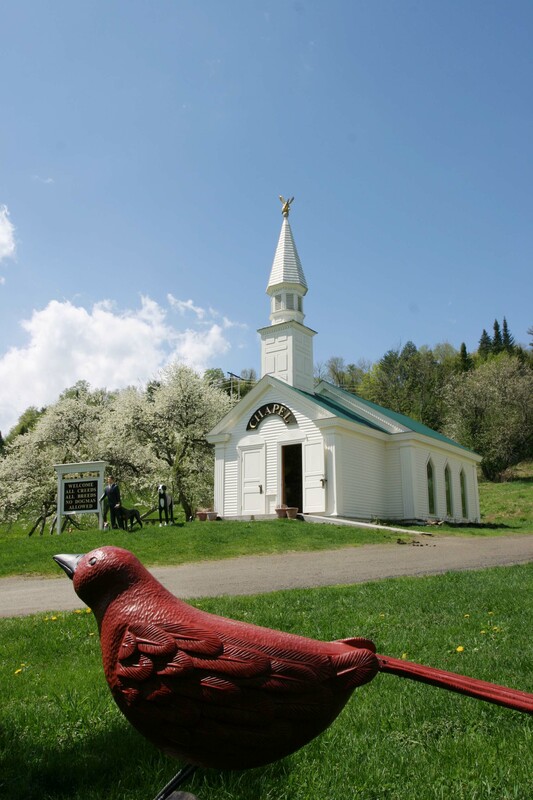 Just down the road from their home is Dog Mountain, where the Dog Chapel is located. "I am a hand-carver, I love the texture you can only get by hand," said Stephen. He had a collection of tools consisting of over 150 chisels, 30 hand planes, and axes. As a hand-carver, Stephen carved almost everyday of the year, taking time out to walk with his dogs. 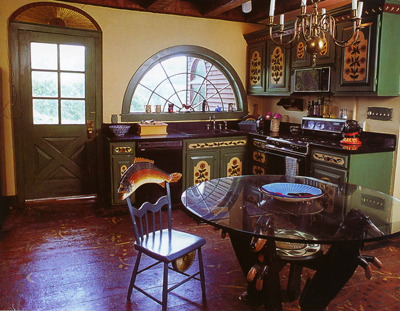 A self-taught sculptor, Stephen started out as an antique furniture picker. 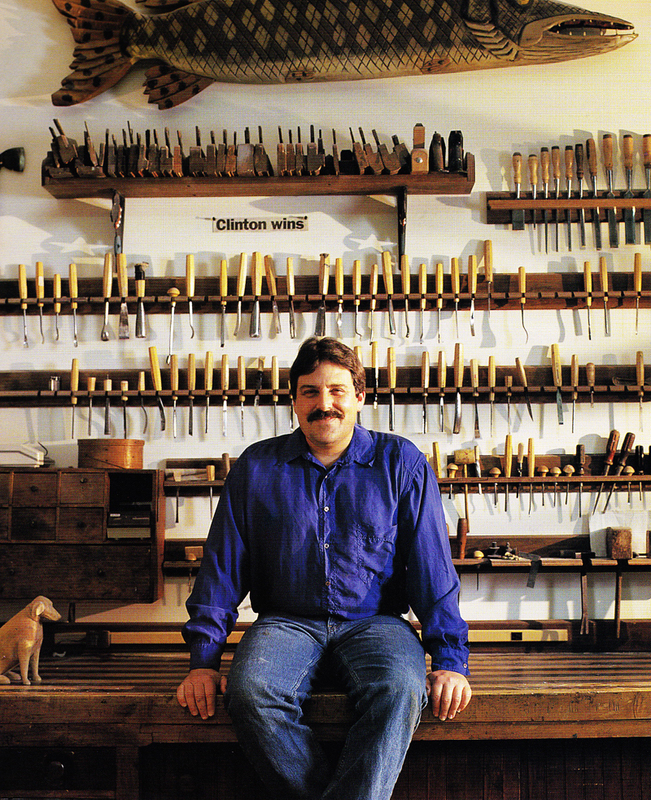 Through that experience, he said, "I learned so much about good design and how to build furniture that lasts forever." Stephen had the good fortune to be discovered after doing his very first woodcarving, an angel. Then began his life as an artist. In 1994, Stephen suffered from Adult Respiratory Distress Syndrome after falling down a flight of stairs, and it left him in a coma for two months. The doctors were not hopeful, but with the help of his wife, Gwen, Stephen made a full recovery. He had to relearn everything, from how to walk to how to sign his own name. 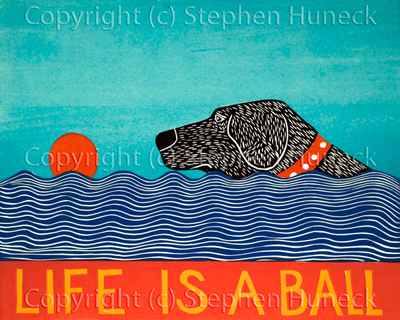 Just before the accident, Stephen had been inspired to do a series of woodcut prints based on his dog Sally. After waking up from the coma, Stephen immediately began work on those woodcuts. The first woodcut he carved was "Life Is A Ball," celebrating his new-found life. It remains one of the most cherished and iconic of Stephen's works. After this near-death experience, Stephen had a vision to build a Dog Chapel, "a place where people can go and celebrate the spiritual bond they have with their dogs." He said, "It is the largest artwork of my life and my most personal." 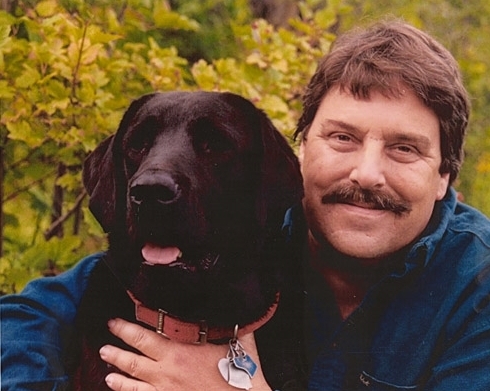 Stephen wrote 10 books inspired by his black Lab, Sally. These include the classic My Dog's Brain and his series of Sally books for young readers (and the young at heart): Sally Goes to the Beach, Sally Goes to the Mountains, Sally Goes to the Vet, Sally's Great Balloon Adventure, and The Dog Chapel. They are all illustrated with his vibrant woodcut prints. Truly, Stephen carved out a niche in the art world as a sculptor with a playful twist. 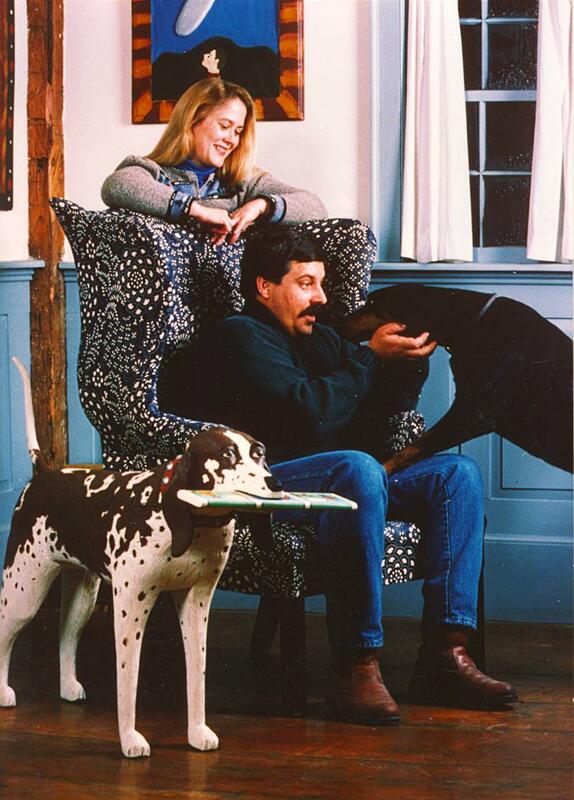 Stephen believed in the healing powers of dogs, Nature, art, and love. It was his wish that he could help others heal, as well as heal himself. After a life-long battle with depression, tragically the artist took his own life on January 7, 2010. His widow, Gwendolyn Ide Huneck, was determined to keep Dog Mountain going in his memory, but she followed him in June of 2013. 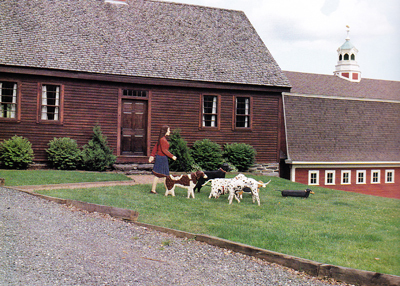 Friends of Dog Mountain, the 501(c)(3) non-profit organization established in 2015 by family and friends of Stephen and Gwen, is committed to ensuring that Dog Mountain, the Stephen Huneck Gallery, and the Dog Chapel will not just survive, but thrive, so Stephen and Gwen's artistic legacy will live on.